One register above the main door, running the length of the front facade, is a long Classical frieze reported to be from the 4th century BC. The carving is beautiful; I only wish I could figure out what legends it depicts. (You can see more of the frieze here.) I love that it was selected for such a prominent visual position. Obviously a cross was inserted over some of the carvings but this was done very carefully and deliberately. Neither Diana(?) with her stag or Mercury(?) were obliterated. I think the sculptors recognized the value of this carving and purposefully sought it out for the church’s entrance. 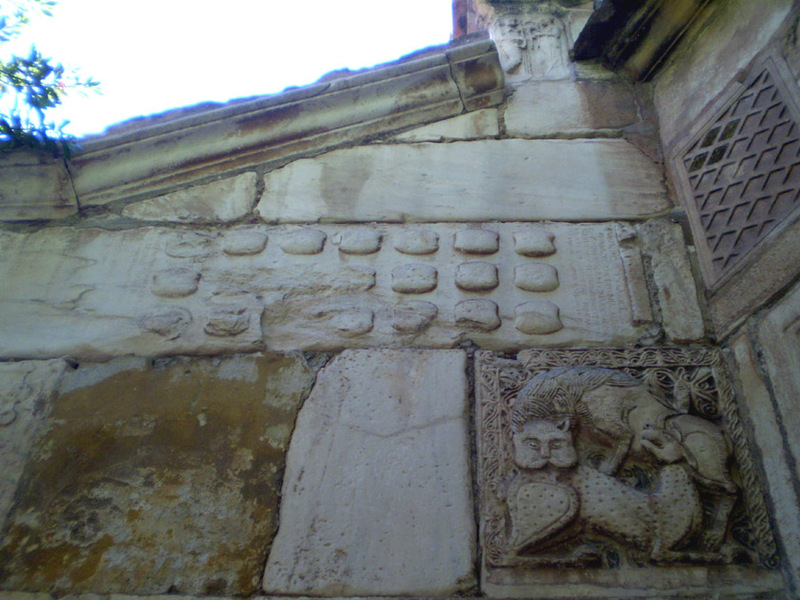 Corner element of the facade of the Panagia Gorgoepikoos Church created from a Classical panel. 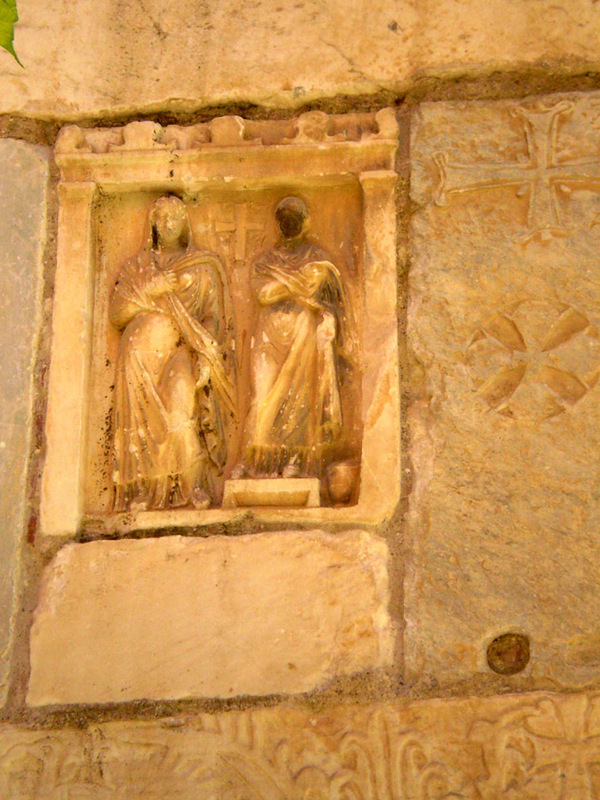 It’s hard to tell when exactly the crosses were added to each panel: in the 4th century upon the adoption of Christianity in the Roman Empire to deface existing art or in the 12th century while preparing for construction of Panagia Gorgoepikoos Church. 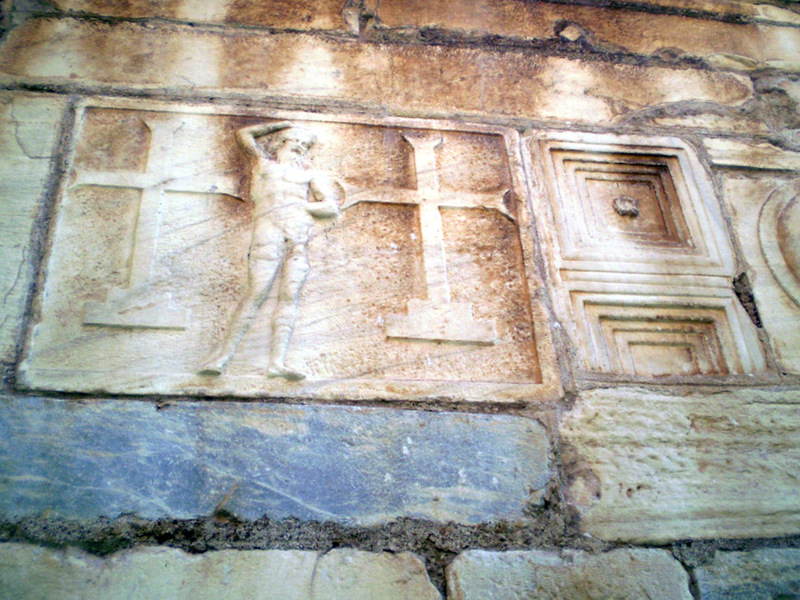 In the panel above, we see a partial classically modeled man and a Patriarchal Cross. This cross with a second upper horizontal element is a unique Byzantine style that didn’t appear until the 10th century. 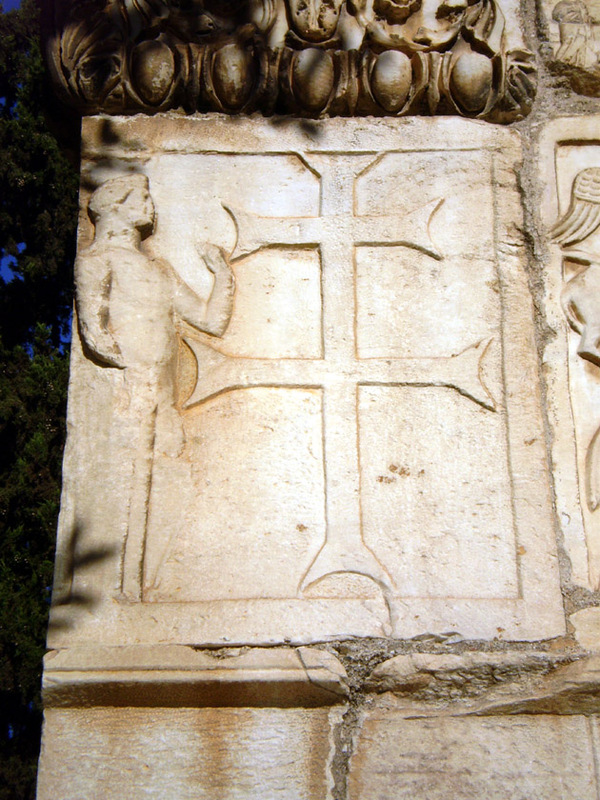 This suggests that panel selection and the incorporation of crosses did not occur until the construction of the Panagia Gorgoepikoos Church. Just to show that the facade really is a hodge-podge of carved elements, there are beautiful Byzantine animals panels (birds, lions, griffins, deer) incorporated throughout the exterior. The image above shows the back of the church with a Byzantine lion killing a leopard. At the very top corner, along the roof line you can see another Roman panel of two figures into which a cross has been carved between them. What I find most interesting in the large panel with carved circles. Given the placement of the Greek text on this stone, this reminds me of Medieval grave markers in which a stone slab would have been used to cover a burial plot. 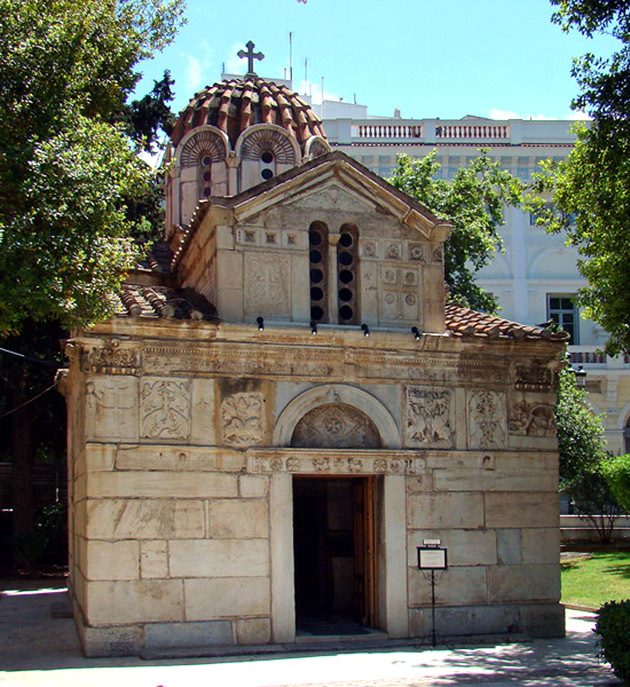 Overall, the Panagia Gorgoepikoos Church is a cool place to explore and a great find for lovers of art history. While small in size, it illustrates the complex relationship between the Byzantines and the remnants of the Greek and Roman civilizations. 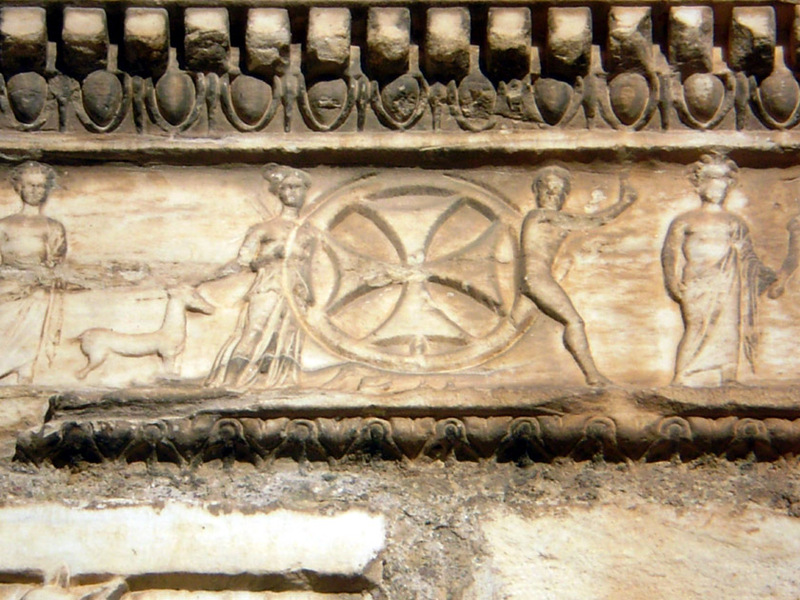 While I have seen Classical works defaced and damaged by later inhabitants, the builders of the Panagia Gorgoepikoos Church appear to have respected and sought out quality art, whether it was Christian or pagan in origin. *Before the 12th century building that stands today, there was a 7th century church on this site. It’s not clear how much of the exterior, or even interior decorative elements, were taken from that building. So interesting to see the mix of influences and such old art still in good condition. Definitely the mix of influences, styles and time-periods is striking. I think that’s what drew me to the exterior of the church. very, very interesting. Terrific post, well researched and on a fascinating topic. Thank you. Thanks Arran! I appreciate the feedback. I’ve saving your St. Patrick’s Cathedral posts for when I can focus best on reading. Looking forward to them! No problem, my pleasure. As for my own recent histories, yes, I don’t blame you waiting, I entirely appreciate they’re on the long side and require a bit of a time-investment. Hope you do find time at some stage and, if so, hope you find it worth while. If not, no pressure, life is for enjoyable reading & learning definitely, but also for living. very best regards – Arran.